Aylesbury (09.07.2018): Prospitalia h-trak, a provider of barcode data capture systems to accurately identify products used in hospitals, has moved from their established UK base in Tring to Aylesbury’s renowned Blue Leanie in Walton Street. The move completes a year of change for the company. Having operated for several years from of a Victorian building in the centre of Tring, the company was acquired in September 2017 by Prospitalia GmbH, Germany’s leading hospital group purchasing organisation and merged with an Australian company to become Prospitalia h-trak. As part of a wider international organisation now, with business operations in Germany, The Netherlands and Australia, the relocation to the Blue Leanie certainly reflects the company’s new corporate aspirations. Amazingly the decoration of the common areas of the building also matches the company’s brand colours! The move across the county border works well for the UK team as many of them live locally and having access to the train station and the town’s eateries and shops is an added bonus. 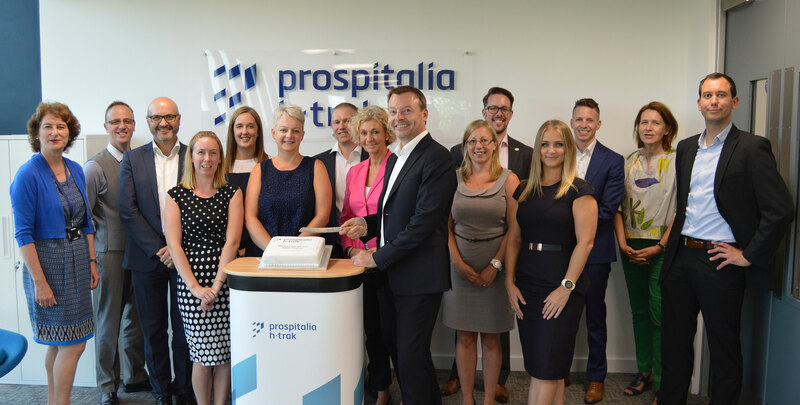 To celebrate their move, Prospitalia h-trak hosted an ‘Office Warming‘ on 2nd July, which was attended by the senior management team from Prospitalia h-trak’s parent company Prospitalia GmbH and guests from Prospitalia h-trak in Australia. Guests from Ulm in Germany included Markus Wild (CEO), Karin Gensow (Chief Operations Officer COO) and Moritz Schulze-Robbecke; and from Melbourne, Michelle West (Executive Director Operations) were welcomed to Aylesbury by Kirk Kikirekov, Managing Director of Prospitalia h-trak. ‘It gives me great pleasure to be opening our new office in Aylesbury at the Blue Leanie. The Blue Leanie is an iconic building in Aylesbury, with a unique design that exudes a certain flare and confidence, making it the ideal home for Prospitalia h-trak. I would like to thank our guests for celebrating this momentous time in our history as a company, but also the Prospitalia h-trak staff in the UK who worked tirelessly over a relatively short timeframe to make this happen’.